The Carter House in Vanceburg. LCHS Principal Jack Lykins has been working overtime to make sure the annual prom event goes smoothly in its new location this year in Downtown Vanceburg. Lykins said he has collaborated with local officials and business owners to arrange for the expected influx of traffic Saturday evening with the prom set to be held at the Carter House in Vanceburg. 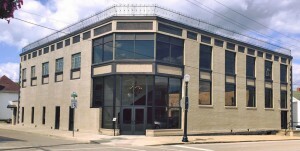 The facility is a recently renovated hotel property at the corner of Main and Second streets and has been chosen as the venue for the formal event. Lykins said the parking plan will facilitate the Vanceburg businesses that will be open Saturday evening, adding that Second Street Diner and Riverbend Pub and Grill are planning dinner specials for the evening. Riverbend will have outdoor dining available throughout the evening for all ages. “We’ve reviewed all of the available parking in the downtown area and have determined there will be sufficient parking for those attending and participating in the prom,” Lykins said. In addition to on-street parking, the Merchant’s Lot (near the Depot Museum) and recently completed church parking lot at the corner of Front and Main streets are nearest the venue and will fill early, Lykins said. Other designated parking areas include lots at Vanceburg Baptist Church, Vanceburg Christian Church and Trace Creek Construction. Lykins said the streets in the immediate vicinity of the Carter House will be open only to pedestrian traffic Saturday evening in an added effort to ensure the safety of those attending. Lykins said he had the idea about a year ago to hold the prom at a location other than the school gymnasium. Lykins said most of the options that had been under consideration for the event are located outside of Lewis County. That changed with the recent completion of the renovation of the Carter House in Downtown Vanceburg. The building was originally a three story hotel, built in 1897. The top floor was removed following a fire and the building later housed various businesses and offices. The City of Vanceburg eventually became the owner of the property and sold it to Shirley and Cary Cagle in 2015. The Cagles had earlier purchased a building on Second Street in Vanceburg that had been home to Hickle’s Pool Room for many years. The couple renovated that building to create Second Street Diner on the first floor and an apartment on the second floor. The Cagles recently completed an extensive renovation that allowed for a large entertainment room and dining facility on the first floor of the Carter House. The facility opened last year and has been the location of several events including weddings, receptions, parties and meeting gatherings. “We thought the Carter House would be a great place to hold prom,” Lykins said. He added the City of Vanceburg has been very cooperative in offering to alter traffic on prom night to allow sufficient parking and create a safer area in the vicinity of the Carter House. Lykins said several prom goers stop by Veterans Memorial Park and other Vanceburg locations for photo opportunities on prom night. He added the prom processional could begin at the park and travel about a block to end at the Carter House. “It depends on the weather but I believe that would add a great deal to the prom activities,” Lykins said. He added he had even been in contact with CSX Transportation and they had agreed to lower the speed of any trains traveling through the city from Saturday afternoon through Saturday night. Vanceburg Police Chief Joe Billman said extra officers, including LCSO deputies and KSP troopers, will be on duty in the city to help ensure the safety of the participating students. Lykins said the LCHS Junior Class, which hosts the prom annually, was very receptive to the idea and are excited about the decorating possibilities at the facility. Students will be decorating the facility throughout the week and motorists are urged to exercise caution in the area during this time. “I believe this will become an annual tradition,” Lykins said. Prom is scheduled for Saturday, April 28, from 8:00 p.m. until Midnight. The Grand March is set to begin at 7:00 p.m. from the gazebo at Veterans’ Memorial Park. In the event of rain, the Grand March will begin at Vanceburg Christian Church. The National Weather Service has predicted a slight chance of showers for our area Saturday evening.